The amount of productive, unproductive and neutral time in hours. To view detailed statistics about the work, click on the button “Statistics”. How to suspend the monitoring for a certain time? Monitoring can be suspended for a few minutes / hours, or until the end of the day. 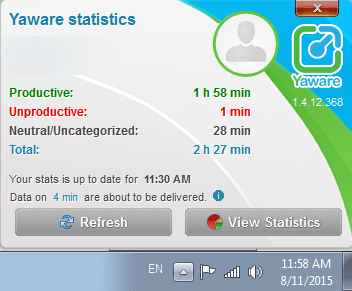 To do this, right-click on the Yaware.TimeTracker icon in the system tray. Next, select “Suspend monitoring” and enter the time of suspense. After the specified period the monitoring will resume automatically. If you need to resume the monitoring before the specified time runs out, click on “Resume”. How to send log files? 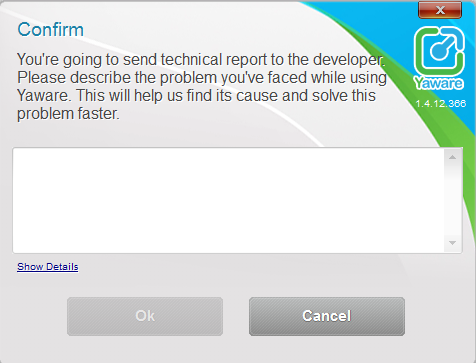 Log files – is a technical information about the performance of Yaware.TimeTracker on a user’s computer. It helps the technicians determine the reason of incorrect work of application much faster.